Earl and Eleanor's third child was a boy! Sheldon Earl was born on January 30, 1960. Sheldon married Wanda May Wright. They have three children and reside in Brandon, MB. They have two daughters: Ashley Amanda May was born October 31,1985; Nicole Ellen was born December 26, 1990; and a son, Evan Patrick Roy, was born December 30, 1991. Sheldon is a dangerous goods driver for Welder's Supply Limited. Wanda is a columnist for The Brandon Sun. Wanda and Sheldon also own and operate Jig N' Rig Bait and Tackle, a fishing supply store located in Brandon. Yvonne and I moved from Medicine Hat, AB to Broadview, SK, December 15, 1984, and purchased Edward's Motel. We operated the Motel until March 1988, and then returned to our home in Erickson, MB. My wife, Yvonne, passed away very suddenly on April 2, 1988, a very sad time for our family. I (Ernie) work part-time for Mr. Henry Wall and The Winnipeg Free Press, and also operate the Erickson Trailer Court, which Yvonne and I started in the mid-70's. I live in Erickson on the property previously owned by Mr. Gustav Lundman. My youngest son, Marc, who designed the cover for Forest to Field 1984, completed high school at Crocus Plains in Brandon and went on to work at numerous jobs, ending up in Winnipeg. He married Caroline Hillhouse, whose parents are from Winnipeg and are deceased. Marc has his own business in auto body repair. Caroline works for a manufacturing company in Winnipeg as office manager. They have no family and presently live in East Kildonan at 490 Winterton Avenue. Dwight and Gladys (Wall) Ullberg both worked for Manitoba Hydro in The Pas. After 11 years in The Pas, they now reside in Winnipeg. Dwight is still employed with Manitoba Hydro and Gladys is enjoying keeping up with the family. Dwight keeps very active with his children from coaching to participating in a marathon. Gladys loves watching and encouraging from the sidelines. Kristin grad­ uated from Westgate Mennonite Collegiate. She then attended Moorehead State on a Scholarship with volley­ ball. Now, she intends to further her education with a degree in Bachelor of Nursing. Colin will be part of 'Grad 2000' at Westgate Mennonite Collegiate. Colin has been very active in ball, volleyball and hockey. Vaughn and Brenda continued to reside in the Village of Erickson until 1994, when they obtained 10 acres from Brenda's parents on SW 6-19-18W in the RM of Park. Vaughn has been employed as a District Support Representative for Manitoba Hydro in Erickson since 1987. He was actively involved with coaching and assisting vari­ ous levels of hockey and baseball while the children were participating in youth sports. He spent several years as a volunteer on the Erickson Ambulance Service and has served on the Erickson Fire Department since the mid 1980's and is presently the Fire Chief. 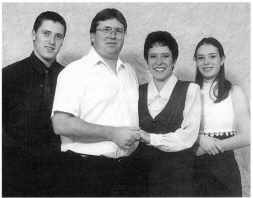 Brenda was employed at the Onanole Elementary School from 1981-1984, and at the Erickson Co-op from 1988 until September of 1991 when she took a Computerized Office Accounting course at Cambrian Business College in Brandon. In 1992 she commenced employment as Receptionist/Clerk at the Erickson District Health Centre where she is still employed. Tyler graduated from Erickson Collegiate III 1997 and spent time in Kelowna, BC and at home working prior to attending SAlT (Southern Alberta Institute of Technology) in Calgary where he is completing his first year of electronics. He hopes to be accepted into Broadcasting Electronics in the fall of 2000. Randeana graduated from Erickson Collegiate in 1999, and relocated to Calgary for the winter months. She plans to remain in the workforce for a couple of years before furthering her education.